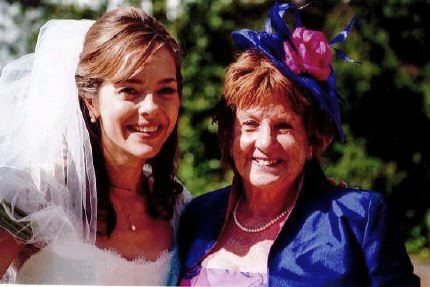 Before my mum Margaret was diagnosed with bowel cancer, I have to admit I didn’t really know much about it. I was shocked to find out that it’s the UK’s second biggest cancer killer, taking almost 16,000 lives every year. Not enough people know about bowel cancer or feel able to talk about it. This has to change. Thankfully my mum, who is a retired nurse, did know about bowel cancer. As soon as she saw blood in her poo she went straight to her GP and was referred for tests. They found a tumour which had just grown through her bowel wall. She was extremely fortunate because the cancer had not spread any further and surgery alone was enough to cure her. It has now been nine years since her diagnosis and we are so grateful she is still with us. The picture to the right is us together on my wedding day. I can’t bear the thought that she might not have been there to share our special day if it hadn’t been caught when it was. In 2009, when she was diagnosed, she had one grandson. She now has seven, including my one year old twins! She is so much healthier now as well and really makes the most of every day. My family is very lucky that my mum went to the GP at the first sign of blood. Not everyone is so aware. Also, not everyone has such clear symptoms, especially when the cancer is at such an early stage. This is why I decided to become a regular supporter of Bowel Cancer UK and Beating Bowel Cancer, by donating £10 a month by direct debit. I really wanted to support a bowel cancer specific charity as I don’t think the disease gets enough funding and attention elsewhere; this is my way of giving back. I have always had such positive experiences of the charity and I know every pound that I give is really appreciated and helps to save more lives. Will you become a regular supporter too? This Bowel Cancer Awareness Month, it would be wonderful if you could join me by setting up a regular donation by Direct Debit today. It’s really simple! Visit here for more information. Every donation to Bowel Cancer UK and Beating Bowel Cancer makes a huge difference – but the regularity of Direct Debits is especially important as it helps the charity to plan ahead. They will have an even greater impact now following the merger, as the new charity has big ambitions. To find out more about their goals for the future, click here. The charity relies almost entirely on funding from the general public and cannot achieve this without regular financial support. My family is very lucky that my mum went to the GP at the first sign of blood. Not everyone is so aware.